Well according to Forbes, Arafat is one of the richest despots in the world, coming in with a fortune of 300 million dollars. How can someone be this rich in such a destroyed economy like what the Palestinian territories has? Forbes has the answer. The president of the Palestinian Authority clings to power despite Israeli and U.S. hostility to his regime. Arafat has feasted on all sorts of funds flowing into the P.A., including aid money, Israeli tax transfers and revenue from a casino and Coca-Cola bottler. Much of the money appears to have gone to pay off others. New Finance Minister Salam Fayyad is cleaning up the P.A. 's finances, cutting off much of Arafat's cash flow. The horror that the occupation force is inflicting is criminal. Free at last, free at last, Iraqis are celebrating their liberation. But jubilant Iraqis were treating the sudden disappearance of Saddam’s regime from Baghdad as the end of his 24-year rule, celebrating in the streets and looting government buildings and warehouses. "People, if you only knew what this man did to Iraq," yelled an old man standing in the road, thrashing at a torn portrait of Saddam with his shoe -- a traditional Arab insult. 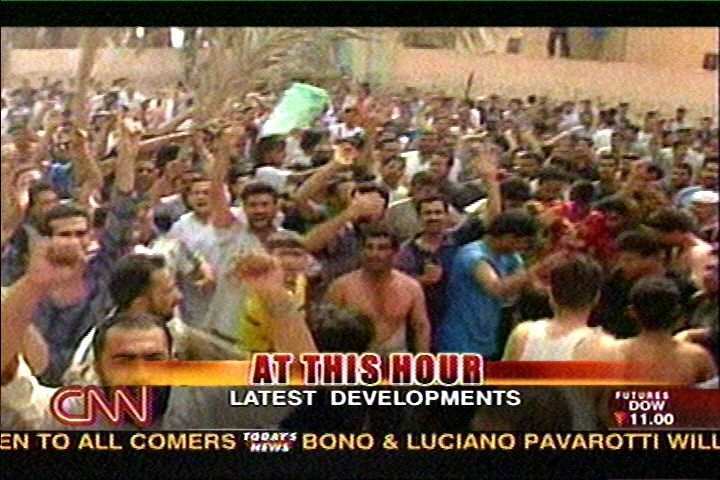 TV pictures showed Iraqis welcoming US forces, and there were also reports of Iraqis celebrating in Kurdish areas of northern Iraq. These included the city of Irbil, 220 miles north of Baghdad, and the Guardian's Luke Harding, in Sulaimaniya, also witnessed scenes of jubilation. "I'm 49, but I never lived a single day," said Yusuf Abed Kazim, a Baghdad imam who was pounding the statue's pedestal. "Only now will I start living. That Saddam Hussein is a murderer and a criminal." 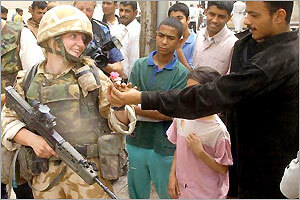 Other Iraqis picked flowers from a nearby garden and handed them to Marines. "Today is my birthday," said Ali Al-Ghazali, 46, a native of southern Iraq. "But it's also the birthday for all Iraqis." "If President Bush will allow, I would like to shake his hand," he said, standing alongside his 74-year-old father, Musa Al-Ghazali. Southeastern Michigan is home to about 300,000 people of various Middle Eastern ethnicities. The area's Arab community is centered in Dearborn. Iraqis joyously welcomed U.S. Marines driving through eastern Baghdad on Wednesday and looters moved in as the remnants of Saddam Hussein's rule collapsed. Hundreds of jubilant Iraqis cheered, danced, waved and threw flowers as Marines advanced through eastern Baghdad and into the centre of Saddam's seat of power. Reuters correspondent Sean Maguire said crowds mobbed a Marine convoy as it drove from the suburbs to the Martyr's Monument, just three km (two miles) east of the central Jumhuriya Bridge over the Tigris river. "We are relieved because for years we lived in anxiety and fear," said Shamoun George, a resident of Baghdad's Karrada district, as American troops entered the area. And we won’t forget where you stood, in your ignorance and fashion-driven hatred of America. We won’t forget. I do not agree with such an aggresive tone but I do not think the words themselves are wrong. When people oppose the war I wonder if they truly understand what life is like under a brutal dictatorship. You figure anyone who claims to be a liberal would be for the liberty of all people, not only from American power but horrible rulers as well. Political prisoners have been freed from the torture chambers they were forced to call home for years. Why did we not see many protesting this type of treatment of our fellow human beings? Do we truly live in a world were we can say that people, other people, should live like this to maintain stability? Is freeing these people not a good thing or are we so jaded that we think they deserve to be tortured for years. Today, though, Adnan was a happy man, so happy that he could barely restrain his excitement. He was finally freed from a prison in downtown Basra, after British troops entered the city and drove the remaining defenders away. And as he took a small group of American journalists on a tour of the hospital, he enthusiastically led a crowd of fellow ex-prisoners, their families, friends and passersby in the first rendition of a pro-American chant that any of us have so far heard: “Nam nam Bush , Sad-Dam No” (“Yes, yes, Bush, Saddam No”). They chanted and danced, filling one of their former cells in a spontaneous celebration. Adnan says his initial crime was simply stealing some bread, but even that had a political dimension. “The bread was only for the ruling Baathists and the rest of us could go hungry—they didn’t care. We had no choice but to steal.” In prison, though, he was tortured to get him to admit that he was an enemy of the regime. “They wanted me to say I stole the bread because I was against the party.” He wouldn’t admit that, but when they asked him to say. “Long live Saddam,” he refused. Adnan claims the tortures became daily occurrences, and he and other prisoners practically dragged us visitors through a succession of cells and torture chambers. In one, electrodes hung from the ceiling. He showed how they were placed on either side of his head while the voltage was turned on. On a wall were some hooks, high up. They produced a concrete reinforcing rod that had been bent into a sort of twisted figure eight, so that each loop served as manacles, and the middle was hooked to the wall. One room even had a complete dentist’s chair and drill set, which the prisoners could use for tooth problems if their relatives paid enough—but was more commonly employed solely to inflict pain. I want someone protesting the war to tell this man that the world community would have saved him and not the Allies. 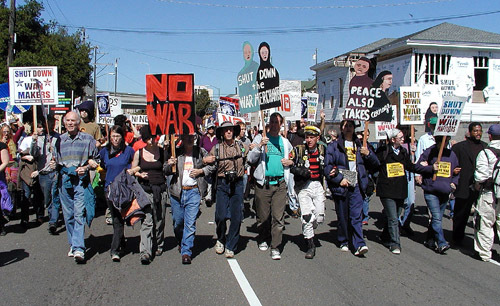 There appears to be at least one Seattle resident who did not take part in anti-war demonstrations, he was training with our military. One way to determine if someone is not anti-war is to note that they are Iraqi. "It's up to the people; it's democratic," he said. "The problem was with Saddam Hussein, not with the Iraqi people. ... We want real democracy." 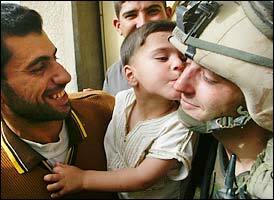 Why of course Iraqi’s do not want Allied forces in their country, some definitely like their children in prison. Yes they must hate us so much more than someone who locks up their children in prison. More than 100 children held in a prison celebrated their freedom as US marines rolled into northeast Baghdad amid chaotic scenes which saw civilians loot weapons from an army compound, a US officer said. "There were parents running up, so happy to have their kids back." "The children had been imprisoned because they had not joined the youth branch of the Baath party," he alleged. "Some of these kids had been in there for five years." The children, who were wearing threadbare clothes and looked under-nourished, walked on the streets crossing their hands as if to mimic handcuffs, before giving the thumbs up sign and shouting their thanks. How blind to their plight do you have to be to think that we should not be there? How blind do you have to be to think that the U.N. would have actually freed or even tried to free those children? Allied forces are beginning to be seen as liberators, I think they now have more confidence that Saddam is really gone. There was a succession of thumbs-up gestures, waves and salutes, while women wearing chadors appeared in doorways smiling and waving as the demise of Saddam's regime in Basra became apparent. Only the occasional distant thud of artillery, firing at the remnants of Iraqi forces elsewhere in Basra, served as a reminder that the battle was not over. 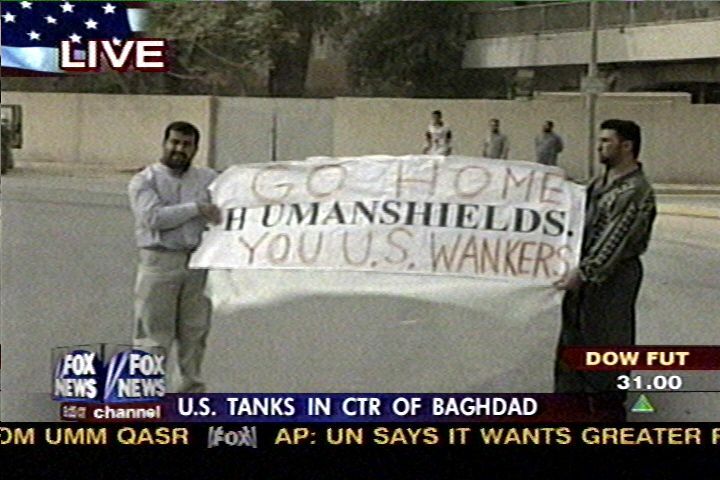 English-speaking Iraqis came up to reporters to express their own delight. Among them was Saad Ahmed, a 54-year-old retired English teacher. "We have been waiting for you for a long time," he said. "We are now happier than you. "You are victorious as far as the war is concerned, but we are victorious in life. We have been living, not as human beings, for more than 30 years." These stories get so little press and not because there are few occurrences but because some just do not want to believe it. The civilian death estimate is anywhere from 300 to 1,350, the later being what Saddam’s government claims. Less than 100 Allied deaths, no terrorist attacks at home so far. This so far blows away some of the big anti-war fears. It is not over but looking pretty good. The Stranger tries to be a real news source and fucks it up. Better luck next time. In their story about Olympia’s favorite terrorist defender Rachel Corrie they manage to be completely bias. explanation, no ordinary Israelis (except for the far-leftist) are considered. photographs are of Palestinians, ISM workers, and Palestinian areas. arguably the most important one the UN has ever approved on the conflict. threats or acts of force"). prevents Israel from defending itself against these terrorist atrocities. years after the PLO was formed. Stick to bitching about the monorail and dogging T.V. shows.